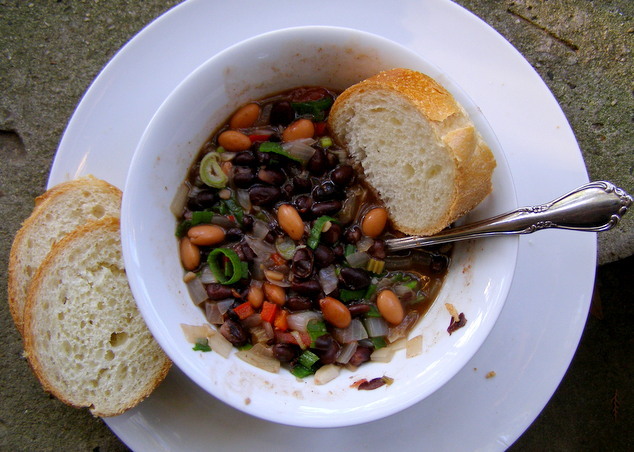 I’ve been looking to add more stew recipes to my arsenal, and recently had success with this modified Rachel Ray black bean soup recipe. It’s simple & hearty, and can easily be vegetarian. Heat a Dutch oven over medium high heat. Add olive oil to the pot, then add the onion, garlic, jalapeno, and bay leaf. Cook 3 to 4 minutes, then add the red pepper. 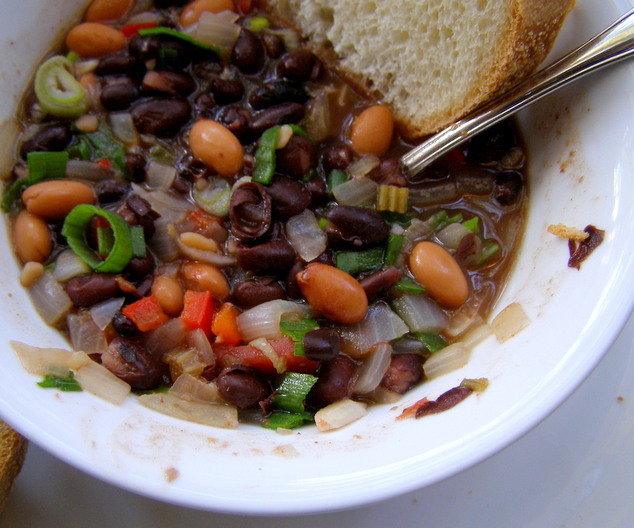 Drain 2 cans of black beans and the can of pinto beans, and add them. Mash the remaining, undrained can of black beans with a fork, and add to the pot along with the coriander, ancho chili powder, salt and pepper, hot sauce, broth, and tomatoes. Bring soup to a boil. Reduce heat and simmer 15 minutes over low heat. Add the lime juice, and remove and discard the bay leaf. Serve with scallions and sliced crusty bread. Oh, my, does that look good, Betty! we have neighbors who I would like to have over and they basically are eating protein and veggies. This might work! Thanks! Hope you guys like it as much as we did =).